Released shortly after 3D World Boxing, Simulmondo's 3D World Tennis suffers from the same good graphics/bad execution faults. You can choose a pre-created player or create your own to go through the ATP tour, beating opponents in the process of climbing the ladder. Like 3D World Boxing, the graphics are the best thing in this game. Players are large and well-animated, and there is a lot of good detail in background scenery. 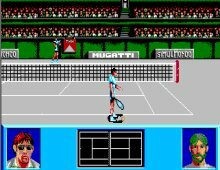 When it comes to gameplay, though, 3D World Tennis is not nearly as robust as Great Courts 2, Advantage Tennis, or any other top-notch tennis game. You view the action from right behind the player, making it very hard to judge the distance between your racket and the ball. It is also almost impossible to change the speed of your shots, and the computer players are as bright as a rock: I won many matches simply by going up to the net and volleying every opportunity I have. Overall, a lackluster tennis game you can do without.